EcoNow’s Trap-Eze Tabs are specifically designed for the food service industry and the break-down of Fats, Oils & Grease (FOG). Trap-Eze Tabs are the most effective, innovative treatment for grease traps. Trap-Eze Tabs are solid, sustained time release tablets utilizing patent pending SORT (Selective Oxygen Release Tabs) technology, which provide active oxygen, buffers and billions of bacterial spores per gram to help clean, deodorize and keep grease trap systems running efficiently with reduced downtime. Food service operators can GO GREEN, SAVE money and PROTECT their business. Go-Green: Trap-Eze Tabs are biodegradable and non-hazardous making them an environmentally friendly way to break-down Fats, Oils & Grease (FOG). Without Trap-Eze Tabs, FOG must be removed to landfills. With Trap-Eze Tabs, FOG is gone. SAVE: Removal of grease requires scheduled pumping. * Using Trap-Eze Tabs eliminates the need to manually clean and pump grease traps of FOG, saving labor time and cost, as well as limiting on-the-job grease pumping accidents. 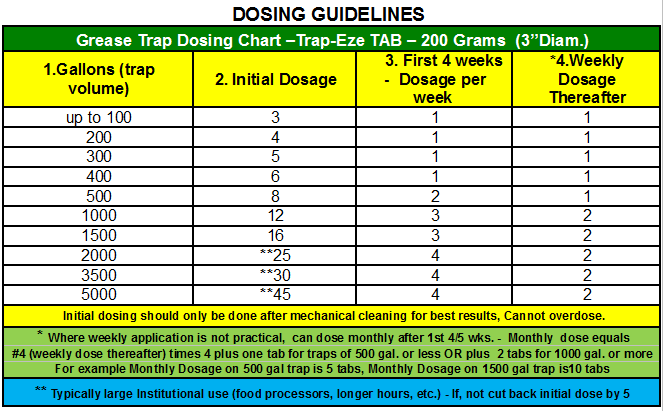 PROTECT: Following are the pitfalls of improper grease disposal and how Trap-Eze Tabs protects. Foul and obnoxious odors from grease are unpleasant and damaging to business. The aerobic active oxygen of Trap-Eze Tabs captures and neutralizes the odor. Grease buildup can cause sewage system failure or backup requiring the business to close. Trap-Eze Tabs ends the threat by eliminating grease buildup. Poor grease trap maintenance risks a breeding ground for roaches & varmints and costly pest control action. Trap-Eze Tabs eliminate this environment. Competitive enzyme products only emulsify or liquefy the grease, while Trap-Eze Tabs digest and eat grease turning it into carbon dioxide and water. Municipal fines & penalties occur from discharging oil & grease (O & G) into wastewater systems. Use of Trap-Eze Tabs eliminates this risk. *Over time sludge may have to be pumped. SORT: Trap-Eze Tabs use patent pending SORT (Selective Oxygen Release Tab) technology. Trap-Eze Tabs add oxygen to grease chambers. Aerobic bacteria need oxygen to grow and thrive. Oxygen starvation happens in the anaerobic environment of a grease trap. When applied regularly, Trap-Eze Tabs effectively breakdown existing grease. In the optimal environment created by Trap-Eze Tabs, the aerobic bacteria break down organic pollutants into carbon dioxide and water. Grease is eliminated! Oxygen generated by Trap-Eze Tabs also helps prevent or eliminate hydrogen sulfide and its pungent “rotten egg” odor. Eliminating hydrogen sulfide, also prevents sulfuric acid, which corrodes septic walls and pipes, possibly leading to system failure. Trap-Eze Tabs oxygenate the water utilizing a revolutionary oxygen delivery system in the form of a time release tablet. Once submerged in wastewater, Trap-Eze Tabs begin to effervesce into micro fine oxygen bubbles. This fizzing action distributes the bacteria, oxygen, and buffers evenly through the environment while treating the bottom sediments. Unlike other liquids or powders which are often quickly discharged due to flow through, Trap-Eze Tabs active ingredients will actually adhere to the equipment, piping and trap surfaces, starting at the bottom. This unique bottom-up distribution means Trap-Eze Tabs will be a very effective treatment. Floor Drains – During normal course of operation, some food particles and grease can fall into the floor drains along with some water accumulations. As a result they often attract fruit flies. This often will result in significant noxious odors. Trap-Eze Mini-Tabs will clean, control the odors and aerobically break down the FOG and solid accumulations.